Homeschooling families are invited to join us for a series of hands-on learning programs designed specifically for homeschoolers ages 4-12. Each age group will study the same theme, but the hands-on activities will be age-appropriate and may vary accordingly. Each day will concentrate on one theme. Families with children younger than 4 years old are welcome to visit the Children’s Museum and Playscapes while registered children are participating in the program. Please note there is no Wednesday group for 4-7 year olds. Using our newest exhibit, Death in the Ice: The Mystery of the Franklin Expedition as a springboard, we will examine what the Arctic environment is like, why the Northwest Passage was so important and explore traditions and lifestyle of the Inuit. In January a new exhibit will open, When This You See, Remember Me: The Photography of Everett Scholfield and George Tingley. We will be exploring this exhibit, learn about the 19th century photographic process, analyze the photographers’ portraits, sit for a portrait and discover where the photos wound up over the last 110 years. Using the beautiful grounds, our art galleries and the Maritime Gallery and a Chanteyman as inspiration, the students will explore a variety of mediums used in creating maritime visual and performing art. Students build their confidence as they practice boat handling and become familiar with the basics of water safety and wind. Our sailing instructors will teach your children how to control their boat and fundamental sailing maneuvers through classroom and on-the-water instruction. See schedule. Registration includes all three class sessions. There is no pro-rating for individual classes. A full, non-refundable payment must be made in advance. 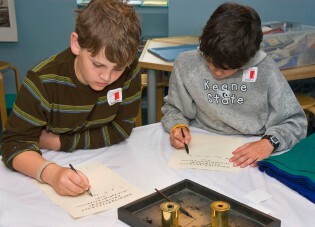 Become a member of Mystic Seaport Museum. Please visit the Community Sailing webpage for homeschool sailing fees and information. Call 860.572.5322, ext. 1 weekdays between 9 a.m.-4 p.m. or email reservations@mysticseaport.org.